Let the celebrations begin for that special someone celebrating their 60th birthday milestone. Have a fantastic party that everyone will remember for years to come. 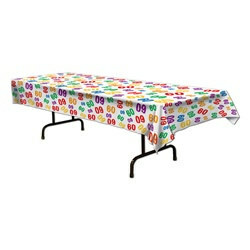 Have fun by using the 60 Tablecover to decorate each party table. The 60 Tablecover has a white background that is decorated with lots of different sizes of 60’s in lots of colors. The 60 Tablecover is designed to fit on a standard sized rectangular table. Decorate the ceiling with the colorful 60 Hanging Whirl Decorations.